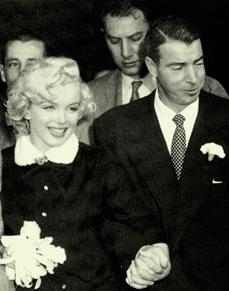 Joe DiMaggio and Marilyn Monroe married today in 1954. The marriage only lasted 247 days, but the two remained friends until Monroe’s death in 1962. When they met, DiMaggio was an American baseball legend and Monroe was a movie starlet about to become a major film star. DiMaggio, retired from baseball, wanted Monroe, who was 12 years his junior (Joe was 37 and Monroe was 25 when they first met), to retire from films and be his stay-at-home wife. Both DiMaggio and Monroe had a tumultuous relationship that may have included physical abuse. Had the two met in 1957 instead of 1952, things might have been different. Monroe wanted a movie career desperately and she wasn’t about to give it all up when things were finally going her way. At the end of their marriage, Monroe was in demand by top directors like Billy Wilder who directed her in The Seven Year Itch (1955). After the two divorced, Monroe married playwright Arthur Miller in 1956. From all accounts, their union was far from a successful one. After Monroe divorced Miller in 1961, she and DiMaggio became friends and rumors abounded that the two would remarry. Both had changed. DiMaggio had mellowed and dealt with his anger and Monroe was thinking of settling down and having a family. For all his faults, DiMaggio truly loved Monroe. Monroe knew that of all the people in her life, she could always count on DiMaggio. When DiMaggio secured Monroe’s release from the Payne Whitney Psychiatric Clinic on February 10, 1961, rumors of remarriage intensified . At the 33rd Academy Awards, host Bob Hope dedicated the Oscar-nominated song “The Second Time Around” to DiMaggio and Monroe. In August of 1962, it looked as if the two might in fact remarry. But this was not to be. Monroe was found dead on August 5, 1962. She was 36 years old. The Yankees retired DiMaggio's Number 5 in 1952. DiMaggio made all of Monroe’s funeral arrangements and for years had flowers sent to her grave on a weekly basis. DiMaggio never spoke about his relationship with Monroe publicly; he never exploited her name in any way. Although he was linked with other women romantically years after Monroe’s death, he never remarried. DiMaggio died on March 9, 1999. He was 84 years old.